When I was a child, someone once described a mitten to me as “a pocket that holds your hand.” That description has stuck with me over the years for its total aptness and whimsy. In the dead of winter, when retrieving mail from my driveway seemed like an Arctic trek, holding hands with a pocket made the whole endeavour seem less daunting and more like an adventure. Even now, years later, when I wear my mittens I imagine that we’re braving the cold together, hand in hand. 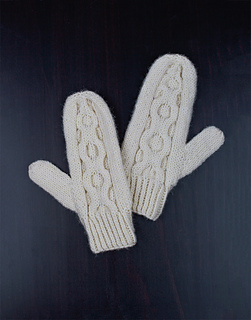 The Medallion Mittens are a fun pair to knit. 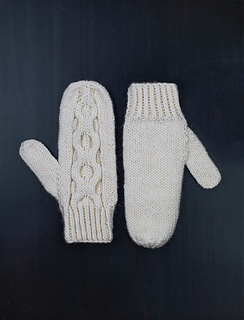 They’re designed to snugly fit the average woman’s hand. Both mittens follow almost identical instructions, with the exception of the setup round. 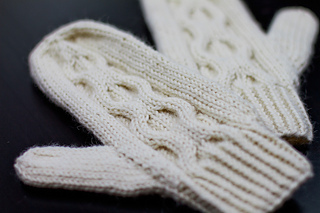 When knitting the left mitten, follow the setup round for the left mitten; when knitting the right mitten, follow the setup round for the right mitten. The rest of the instructions can be worked as is for both mittens.